Home / Women In Islam / Women's Liberation Through Islam - Rights of a Woman. 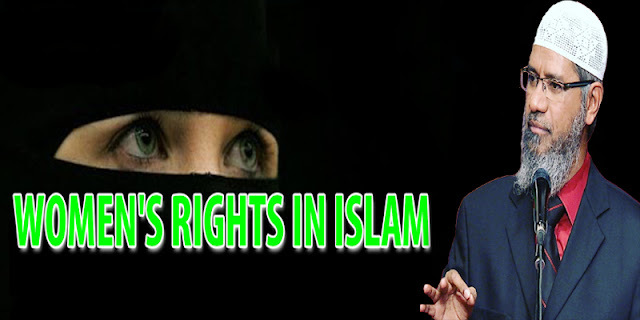 Women's Liberation Through Islam - Rights of a Woman. Today people think that women are liberated in the West and that the women's liberation movement began in the 20th century. Actually, the women's liberation movement was not begun by women but was revealed by God to a man in the seventh century by the name of Muhammad (peace be upon him), who is known as the last Prophet of Islam. The Qur'an and the traditions of the Prophet (Hadith or Sunnah) are the sources from which every Muslim woman derives her rights and duties. Islam, fourteen centuries ago, made women equally accountable to God in glorifying and worshipping Him - setting no limits on her moral progress. Also, Islam established a woman's equality in her humanity with men. Since men and women both came from the same essence, they are equal in their humanity. Women cannot be by nature evil (as some religious belief) or then men would be evil also. Similarly, neither gender can be superior because it would be a contradiction of equality. Women are encouraged in Islam to contribute their opinions and ideas. There are many traditions of the Prophet (pbuh) which indicate women would pose questions directly to him and offer their opinions concerning religion, economics and social matters. The Prophet (pbuh) said: "Seeking knowledge is a mandate for every Muslim (male and female)." This includes knowledge of the Qur'an and the Hadith as well as other knowledge. Men and women both have the capacity for learning and understanding. Since it is also their obligation to promote good behavior and condemn bad behavior in all spheres of life, Muslim women must acquire the appropriate education to perform this duty in accordance with their own natural talents and interests. While maintenance of a home, providing support to her husband, and bearing, raising and teaching of children are among the first and very highly regarded roles for a woman, if she has the skills to work outside the home for the good of the community, she may do so as long as her family obligations are met. Islam recognizes and fosters the natural differences between men and women despite their equality. Some types of work are more suitable for men and other types for women. This in no way diminishes either's effort nor its benefit. God will reward both sexes equally for the value of their work, though it may not necessarily be the same activity. Concerning motherhood, the Prophet (pbuh) said: "Heaven lies under the feet of mothers." This implies that the success of a society can be traced to the mothers that raised it. The first and greatest influence on a person comes from the sense of security, affection, and training received from the mother. Therefore, a woman having children must be educated and conscientious in order to be a skillful parent. A right given to Muslim women by God 1400 years ago is the right to vote. On any public matter, a woman may voice her opinion and participate in politics. One example, narrated in the Qur'an (60:12), is that Muhammad (pbuh) is told that when the believing women come to him and swear their allegiance to Islam, he must accept their oath. This established the right of women to select their leader and publicly declare so. Finally, Islam does not forbid a woman from holding important positions in government. Abdur-Rahman Ibn Auf consulted many women before he recommended Uthman Ibn Affan to be the Caliph. In these verses, God declares that He created men and women to be different, with unique roles, functions and skills. As in society, where there is a division of labor, so too in a family; each member has different responsibilities. Generally, Islam upholds that women are entrusted with the nurturing role, and men, with the guardian role. Therefore, women are given the right of financial support. This guardianship and greater financial responsibility is given to men, requires that they provide women with not only monetary support but also physical protection and kind and respectful treatment. Marriage is therefore not just a physical or emotional necessity, but in fact, a sign from God! It is a relationship of mutual rights and obligations based on divine guidance. God created men and women with complimentary natures, and in the Qur'an, He laid out a system of laws to support harmonious interaction between the sexes. Clothing provides physical protection and covers the beauty and faults of the body. Likewise, a spouse is viewed this way. Each protects the other and hides the faults and compliments the characteristics of the spouse. To foster the love and security that comes with marriage, Muslim wives have various rights. The first of the wife's rights is to receive mahr, a gift from the husband which is part of the marriage contract and required for the legality of the marriage. A wife's rights also extend beyond material needs. She has the right to kind treatment. The Prophet (pbuh) said: "The most perfect believers are the best in conduct. And the best of you are those who are best to their wives." God tells us He created mates and put love, mercy, and tranquillity between them. Both men and women have a need for companionship and sexual needs, and marriage is designed to fulfill those needs. For one spouse to deny this satisfaction to the other, temptation exists to seek it elsewhere. A wife is to keep her husband's secrets and protect their marital privacy. Issues of intimacy or faults of his that would dishonor him, are not to be shared by the wife, just as he is expected to guard her honor. A wife must also guard her husband's property. She must safeguard his home and possessions, to the best of her ability, from theft or damage. She should manage household affairs wisely so as to prevent loss or waste. She should not allow anyone to enter the house whom her husband dislikes nor incur any expenses of which her husband disapproves.